Researchers have long known the incredible properties of silk spun by spiders — incredibly strong, but elastic. 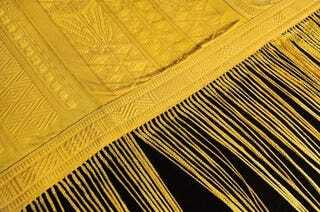 Now a textile expert has woven the first cloth made entirely of spider silk. The catch? It took one million spiders to make. Textile expert Simon Peers undertook the daunting project to create the eleven by four foot cloth — the only large cloth made from spider silk. Looking at the research of French missionary Jacob Paul Camboué, who designed a small device capable of extracting spider silk without harming the spiders, Peers built similar machines to extract silk from Madagascar's female golden orb spiders, which have a naturally golden silk. The cloth ultimately took four years and one million spiders to produce, not to mention the dozens of spider handlers who collected the spiders and kept them from attacking and killing one another. While its tensile strength, on par with steel and Kevlar, and the ability to stretch to 40% beyond its original length without breaking, spider silk would have numerous practical applications if it could be harnessed on a large scale. But researchers have been unable to duplicate the material, either chemically or by inserting spider genes into bacteria or more domesticable animals. So for now, this feat of stunt weaving is mostly an aspirational bit of cloth. It is currently on display at New York's Museum of Natural History.